This collection of papers of the Cox and Chesnut families discusses political, economic, and social aspects of life in the United States during the Early National and antebellum periods. 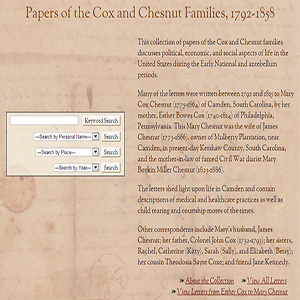 Many of the letters were written between 1792 and 1815 to Mary Cox Chesnut (1775-1864) of Camden, South Carolina, by her mother, Esther Bowes Cox (1740-1814) of Philadelphia, Pennsylvania. This Mary Chesnut was the wife of James Chesnut (1773-1866), owner of Mulberry Plantation, near Camden, in present-day Kershaw County, South Carolina, and the mother-in-law of famed Civil War diarist Mary Boykin Miller Chesnut (1823-1886). The letters shed light upon life in Camden and contain descriptions of medical and healthcare practices as well as child rearing and courtship mores of the times.